Halloween isn’t just a holiday for sticky-fingered kids and adults who like costume parties. Although they can’t eat chocolate and aren’t fans of scary noises, dogs can celebrate Halloween in their own way with some festive Halloween attire. 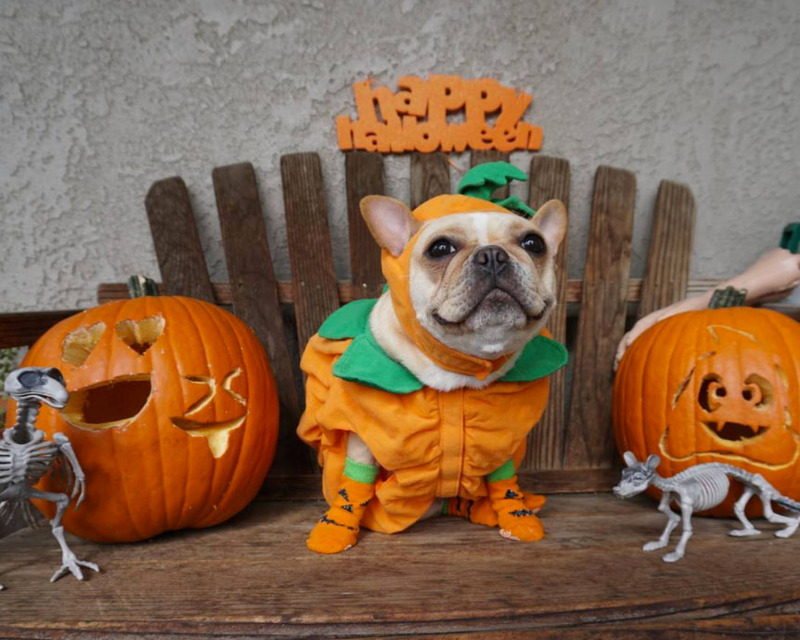 From pumpkins to Beanie Babies, look no further than these dog Halloween costumes from Instagram to help you decide what your favorite pup should dress up as this year. Let’s be real, when it comes to dog Halloween costumes, pups always run away with the award for Most Adorable Costume. Dachshunds are often dressed up as hot dogs for Halloween, but there are so many more potential food-related costumes to consider outside of wieners and buns. Costumes featuring your dog as a pizza slice, taco, or a Starbucks frapuccino are cute AF (and it will make your pup wish his getup was edible). From their perches on the couch, our dogs often watch our favorite sports teams with us, so if you’re a passionate fan, why not have your dogs show off their team spirit in a miniature jersey, cheerleader, or referee uniform? If you’re looking for a dog Halloween costume that will last a lifetime, then classic Halloween characters like pumpkins, skeletons or Dracula never go out of style. Plus, ghost and witch costumes don’t require much material to DIY, so they’re cost-effective. Gotham will be safe with Bat Dog and Robin Dog protecting it! (Or Wonder Woman or Superman, etc.) Since canines are naturally protective and do their best to keep us safe from scary threats like the mailman and loud car alarms, it might be time to give them the thanks they deserve by dressing them up in a caped crusader costume for Halloween. A dog dressed as a lion (or a cat, or a bunny, or a turtle, or…you get the idea) is Instagram gold just waiting to be posted. Normally, a dog’s job consists of napping, eating, and fetching balls, but for Halloween, why not give them a proper occupation? If your dog was a human, would he or she be a police officer or a firefighter or a boat captain?? Book lovers have a plethora of choices when it comes to storybook character costume ideas. You could dress your dog up as Peter Pan, Curious George, or Madeleine. And even though dogs may be closely related to wolves, we think a dog would make a perfect Little Red Riding Hood, too. Movies and TV shows are a goldmine for Halloween costume ideas for both humans and dogs, alike. Show off your love of Games of Thrones by dressing your pup up as a dragon, or go the classic Hollywood route by costuming your dog as Dorothy (not Toto) from The Wizard of Oz. Is there anything cuter than a dog dressed up as a Minion? We think not. Beanie babies, those freaking adoraable plush toys from the ‘90s, are a clever and low-effort costume to make for your pup. Simply DIY a “Ty” label, attach to your dog’s collar, and voilà! Instant Halloween costume. Some owners enjoy giving their dogs an international flair for Halloween, like these French bulldogs who look très cuddly in their berets. Here’s hoping these two don’t “oui-oui” all over the house.